Baseball is the President tossing out the first ball of the season and a scrubby schoolboy playing catch with his dad on a Mississippi farm. A tall, thin old man waving a scorecard from the corner of his dugout. That's baseball. And so is the big, fat guy with a bulbous nose running home one of his (Babe Ruth's) 714 home runs. There's a man in Mobile who remembers that Honus Wagner hit a triple in Pittsburgh forty-six years ago. That's baseball. So is the scout reporting that a sixteen year old pitcher in Cheyenne is a coming Walter Johnson. Baseball is a spirited race of man against man, reflex against reflex. A game of inches. Every skill is measured. Every heroic, every failing is seen and cheered, or booed. And then becomes a statistic. In baseball democracy shines its clearest. The only race that matters is the race to the bag. The creed is the rulebook. Color merely something to distinguish one team's uniform from another. Baseball is a rookie. His experience no bigger than the lump in his throat as he begins fulfillment of his dream. It's a veteran too, a tired old man of thirty-five hoping that those aching muscles can pull him through another sweltering August and September. Nicknames are baseball, names like Zeke and Pie and Kiki and Home Run and Cracker and Dizzy and Dazzy. Baseball just a game as simple as a ball and bat. Yet, as complex as the American spirit it symbolizes. A sport, a business and sometimes almost even a religion. Baseball is cigar smoke, hot roasted peanuts, The Sporting News, ladies day, "Down in Front", Take Me Out to the Ball Game, and the Star Spangled Banner. 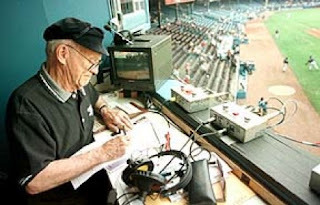 The Voice of Summer died in the spring, just before the Tigers’ first pitch of the evening. That was fitting. Ernie Harwell never wanted to interrupt the game. Mr. “Looong Gone” is gone now. Like the home run that lands in the seats, like the final out of the ninth inning, like the thousands of games he closed with his signature sign-offs, his genteel voice telling us he’d see us tomorrow. Gone now. No more tomorrows. At 92, after a battle with bile duct cancer that stretched into extra innings, Ernie let go of this world and moved on to the higher place from which we were certain he was sent. Gone now. We knew this was coming. Ernie, in his final grace, prepared us for it. He told us not to worry. We still worried. He told us not to cry. We cried anyhow. He told us he had led the life he’d wanted, that he was ready to say good-bye. Yes, as Mitch Albom said, we knew it was almost time to let go of Ernie, but none of us wanted to think about it, so when it came, it came as a shock. We were never going to be ready. I"ll admit right up front that I don't love the game of baseball. Even though I had lived in or near Detroit nearly all of my life, I had been to Tiger Stadium only once. I couldn't tell you who won or who played on that day, or even when it was. What resonated for me was Ernie Harwell's cocky drawl--his "looooong gone", his "sitting like the house by the side of the road", his way of pulling us in, letting us know that at this moment, in this place, baseball is all that matters. There were enough people in my family who did love baseball, so the Tiger game was on the TV or the radio whenever and wherever they played. I didn't follow, but I didn't mind--I think mainly because of Ernie's voice. There was a cadence to his voice that kept a kind of rhythm going. There was nothing jarring or annoying. It was almost soothing. It was Ernie. I had the honor of spending a couple of hours with Ernie Harwell once. We were holding a book fair in our town and we invited him to come and sign his book, "Tuned to Baseball". He showed up right on time only to find a near-empty room. I don't remember the particulars, but somehow the word didn't get out, or the weather was bad, but for two hours I had Ernie nearly to myself. After an hour or so, I practically begged him to go home. I was mortified that he had taken the time to come to our town and so few people had come out to meet him. He, gracious gentleman that he was, insisted on staying the full two hours. I got over my mortification and we sat down and talked. He told stories that I knew he had told dozens of times before, but he had a way of telling them with such enthusiasm I was lulled into believing they were told just for me. He talked about Lulu, and I loved him even more because he loved Lulu unabashedly. He asked me about my life and hung on my every word. He asked questions and apologized because he got the name of one of my children wrong. He was exactly like what everyone who has met him says about him: genuinely interested in what I was talking about. He was very nice to me." During my talk with Ernie I told him that my father-in-law was the ultimate Tiger fan and never missed a game, to the point of carrying his boom-box with him everywhere he went so he wouldn't miss an inning. I asked Ernie if he would say hello to him on the air, and he said he would be happy to. He did it, too, during the very next game, and my father-in-law felt as though he had been knighted. In 1991 the announcement came that Ernie was leaving his job as Tiger broadcaster. Nobody believed for a minute that it was his choice to say goodbye to the broadcast booth. Rumors flew that he was being forced out, but, ever the gentleman, Ernie didn't add to them. But before long word came that Tiger management and WJR were--yes, indeedy--looking for newer, younger blood. What boneheads! He was Ernie and they were idiots. The uproar was long and loud and entirely predictable, but Bo Schembechler, former U-M football coach turned Tiger head honcho, stuck with the plan and added fuel to the fire by going around crowing about his decision-making skills. So Ernie was side-lined during the 1992 season, when newer, younger blood came in--and flopped so pitifully you actually had to feel sorry for them. Nobody could fill Ernie's shoes--not in Detroit, anyway. By the spring of 1993, pizza king Mike Ilitch (Little Caesar's) had purchased the Tiger franchise from pizza king Tom Monaghan (Domino's) and BoSchembechler was out and Ernie Harwell was back in. Life was back to normal in Detroit. Ernie finally retired for good in 2002, and his fans were still not ready. He died three days ago and we're still not ready. We can't stop thinking about him or talking about him or caring about him. Because every Tiger fan knows that wherever Ernie is, he can't stop talking about or thinking about or caring about them. I too met Mr. Harwell sometime in the 80's at a book signing in Westland Mall. He was gracious and polite just as you and Mike described him. Ernie's passing is sad on so many levels, as I told my sister, it is like a member of our ly has died. To you Mr. Harwell on behalf of thousands, ney millions of other Tiger fans and Michganders alike, you sir were a true orginal, summer will never be the same without you. The fact that so many people found EH's voice soothing and memorable would make him so happy. I loved reading all of the accolades. He was one of a kind. Thanks for writing about your memories here, Steve. Memories are beautiful and painful and so necessary. They keep our loved ones with us always.